As an athlete I usually have two breakfasts, one before an early workout, usually a banana and dry cereal, and a second more substantial one after my workout. When I used to eat eggs my favorite post run meal was 2-3 fried eggs or an omelette with some avocado and hot sauce. Nothing beats a salty, spicy, and protein rich recovery meal. 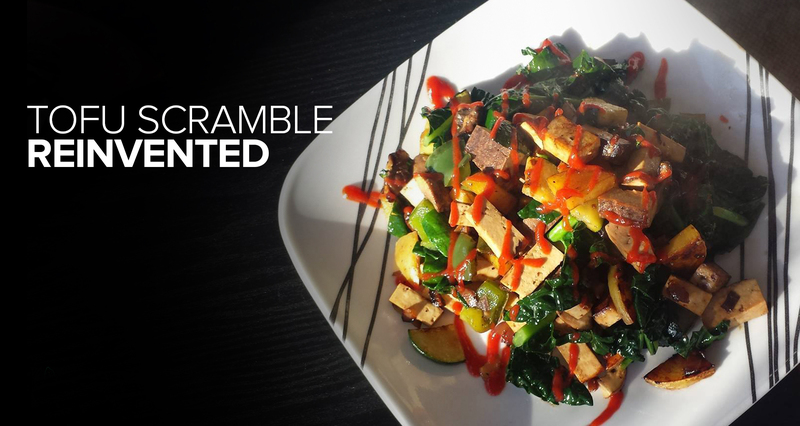 After going vegan I experimented a bit before landing on this easy and best tofu scramble recipe. The key to the success of this recipe is the tofu you use and the timing of when to add which veggies during the cooking process. 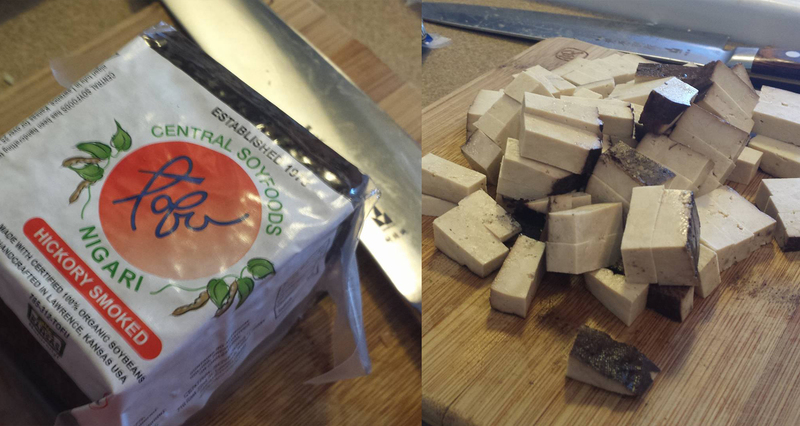 I’ve tried every brand of tofu and have yet to find one better than Central Soyfoods. It’s firm, does not break down during cooking, absorbs flavors beautifully, and adapts itself to any dish. The veggies listed after the first 3 are more of suggestions based on what’s in season. You can get creative with all types of interesting pairings. I’ve done tomato basil, asparagus and wild mushrooms etc. I recommend using the onion, garlic, and potato as your base and getting creative from there. 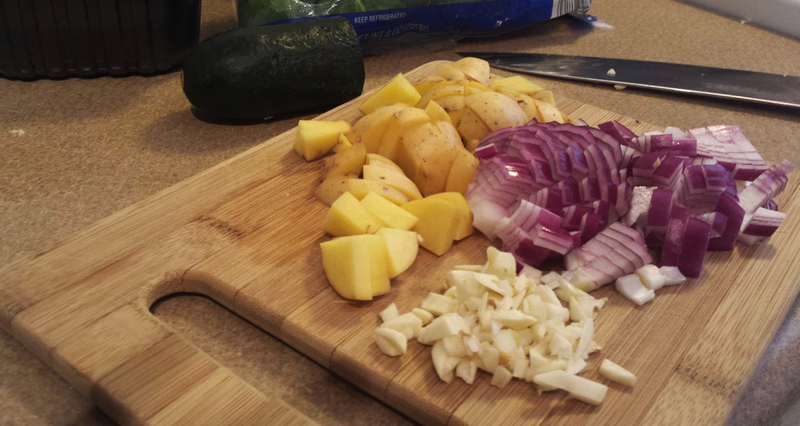 Step 2 – Chop your onion and potato and roughly mince your garlic. Check your pan by dripping water into it..if it sizzles it’s ready to go. Add onion, potato and garlic, stir to even out and let them cook without stirring for 2 mins on medium high. At this phase of the cooking process you’re trying to develop color and flavor on your base veggies the same way you would when searing a steak or pork chop. Step 3 – After the 2-3 minutes is up and you start seeing nice golden color developing, bring the heat down to medium and continue cooking the onion, garlic, and potato for another 3-4 mins until caramelized and aromatic. Step 4 – Chop your zucchini and bell pepper and add to pan. You will notice there is a timeline for when you add which veggies. Some veggies take longer to cook or develop flavor but usually are the tastiest so we always start with those and then add other in their cooking order ending with things like kale and spinach the merely need to be wilted for a few moments. 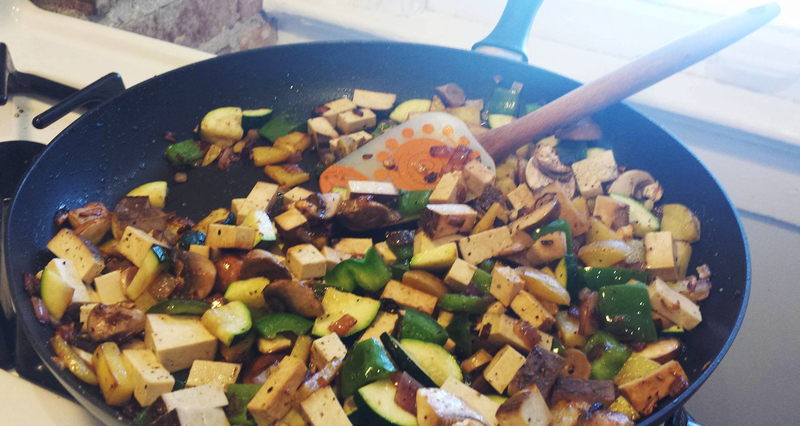 Step 5 – Cube your tofu and add to the vegetables. 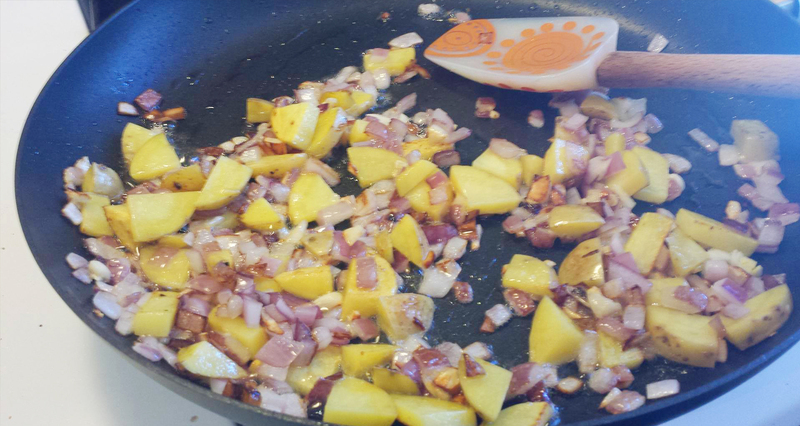 Continue cooking on medium as the tofu absorbs the onion and garlic flavors. Step 6 – After you’ve given the tofu a chance to heat up and gently cook, now is the ideal time to season as it will soak up flavor more readily at higher temps. 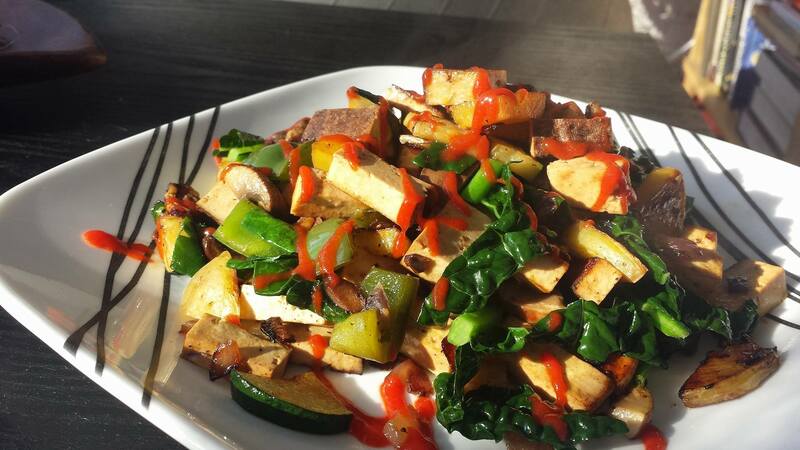 The smokiness of this tofu goes wonderfully with Worcestershire sauce. Add in your Worcestershire, salt and pepper then give it all a good stir. Step 7 – Mushrooms have a very high water content and a quick cook time so now that we’re approaching the end, we’ll chop them up and add them to the mix. For this version I wanted them mostly for texture but if you’re a mushroom fanatic and want a strong flavor of them, add a variety at the beginning, chopped finally and saute them down to get good color. 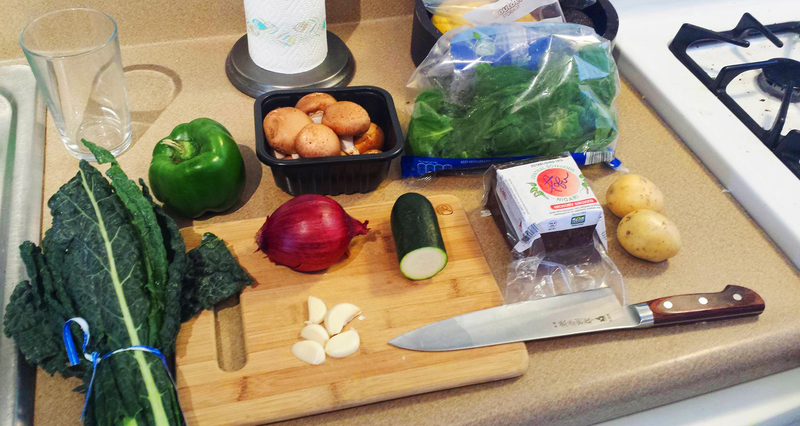 Step 8 – Loosely chop your kale and spinach. I like flat leaf (lacinato) kale because of its deep color and mellow flavor. Add the kale on top first and just let it sit for a min or two and be cooked gently by the steam. 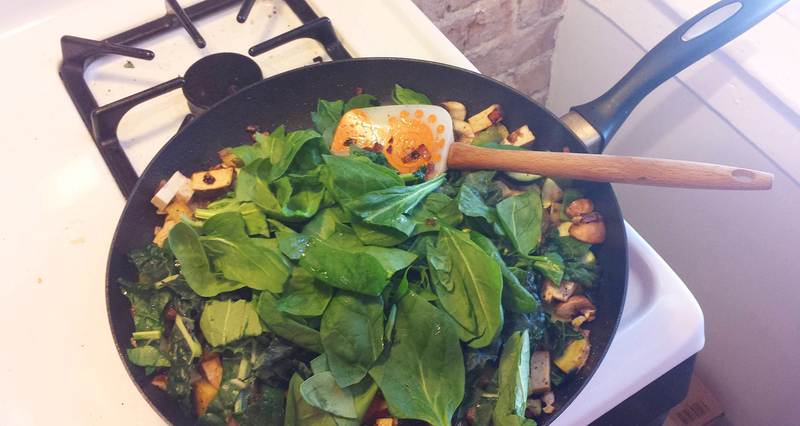 Then add the spinach on top and wait another minute. Both greens should be wilted down. Stir in and turn off heat. All done! Serve it up topped with your favorite hot sauce or avocado and enjoy.